East Texas twins J.E. (James) and G.A. 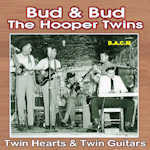 (George) Hooper began playing the Houston country dance clubs in the mid 30s, cutting their first records in Houston in 1950 as Bud & Bud with J.E. on guitar, G.A. on mandolin. Our CD includes the best of their studio recordings, featuring top Houston session players of the era; plus a few of rare radio programs. Good foot tapping country with a nice mix of current hits, standards and western swing, their style, treading the live between honky-tonk and western swing.